In the hours immediately following any disaster, people run around like crazy. They expend far more energy than normal, and they eat far less than normal, and then they collapse. What they need in order to prevent physical collapse is to keep their blood sugar stable by eating a little something while they’re in the process of running around like crazy. In the hours following a catastrophe but prior to the arrival of the Red Cross soup kitchens, it’s not exactly easy to make up a sandwich or whip up some stew. Therefore, it’s good to have some emergency snacks stashed away for this purpose. 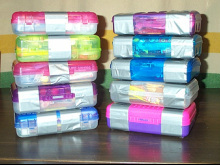 In my frequent trips to thrift shops, I began collecting plastic pencil boxes of the type that kids keep their school supplies in. I then filled them with non-perishable foods that can be eaten immediately. [Step One: Unwrap. Step Two: Insert in mouth. Step Three: Chew. Swallow. Sigh contentedly.] I dubbed these handy packets of instant nutrition “Insta-Eat” or “One Minute Munchies”. I filled these pencil boxes with foods that are as long-lasting as possible, bordering on absolutely non-perishable, because I don’t know how long they’re going to be hanging out at my house before being used. Therefore, chocolate bars, with a shelf-life of about a year, were Out. Hard candies, with a shelf life of centuries, were In. Nuts, loaded with oils that spoil, were Out, but jerky, which lasts pretty much indefinitely, was In. I was also looking for foods that offer dense nutrition, so things like Cheetoes were Out, while packets of parmesan cheese (which I pick up at Pizza Hut) were In. I was also adamant that the food be really and truly instant. Cans of tuna would be tasty, but cans of tuna require a can opener, which may be difficult to track down in an emergency situation. Packets of tuna, which can be ripped open, were much better. Little cans of potted meat and Vienna sausages have pull-tab tops, which is easy and instant. Nothing was included that required adding water or heating up. I bought only stuff that was easy to eat and didn’t make a big sticky mess behind. I was looking for a good mix of sweet, salty, and sour. Also, I wanted foods with a high “Mmmmm” factor. They had to be yummy. 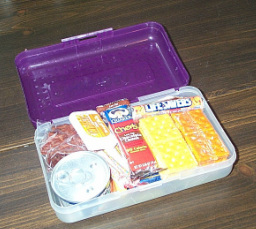 There are a variety of situations where having a bunch of pencil boxes full of ready-to-eat snacks could come in handy. My main thought in assembling these snack packs was to keep first responders and emergency workers on their feet in the hours immediately following a disaster. I was inspired by a first-person account of the days following the nuclear bomb falling on Hiroshima. What few doctors and nurses had been available had become so overwhelmed and exhausted that some of them simply ran away. There was no food, no water, and no supplies for the thousands of injured people, and there was also no food, no water, and no supplies for the medical personnel who were trying to help. Following any calamity, there will be firemen, cops, ambulance drivers, doctors, nurses, and search and rescue teams who will be overburdened and underfed. It may take considerable time for the cavalry to arrive with soup, coffee, and sandwiches. The timely delivery of Insta-Eat snack packs may be able to help them stay on their feet and keep going long enough for relief to arrive. Be sure to tape the boxes closed so they can be tossed around without spilling their goods. If you store your Insta-Eat packages in your car, attic, shed, or garage, be aware that temperature extremes will drastically reduce their shelf-life. Interestingly enough, the contents of the ten Insta-Eat snack packs pictured here cost almost exactly the same as this. There will be refugees, there will be evacuees, and there will be injured patients crowding the hospital corridors. This food is not for them. The frightened, injured child waiting to see a doctor would surely appreciate such a package, but it’s far more important to make sure that the doctor who is going to tend to that child remains alert and functioning. The little old lady who’s been pulled out from under the rubble might like a bite to eat, but it’s more important that the search and rescue team that pulled her out has the strength to pull the next person out. It may sound harsh to ignore the injured child and the little old lady, but it’s harsher yet to see doctors collapsing and nurses running away. Adrenaline only goes so far. After that, you need jerky. There are other uses for these easy-eat treats as well, depending on the situation. 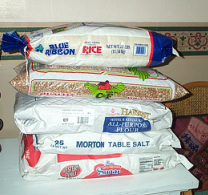 Blizzard knocked the power out and there’s no way to cook? Nuclear bomb just gone off and you need to spend the next ten days in your basement? Hurricane coming and you have to drive to the other side of the state with three kids crying in the back seat? Zombie hordes descending and you have to head for the hills? Just pull out your Insta-Eat boxes and you’ll be far better off than all those people who are desperately rummaging through their cupboards for stale crackers. One of the best features of the Insta-Eat packets is their portability. You can stick them in your purse, backpack, glove box, saddle bag, briefcase, suitcase, duffel bag, or car trunk. Insta-Eat boxes are not cheap to assemble. 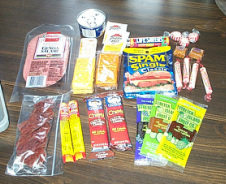 Even though many of the items can be purchased at the local dollar store, it still costs at least five bucks to fill a pencil box full of quality ready-to-eat snacks which will keep one person fed for one day at most. In terms of per-serving cost, it’s not going to be a bargain, when $5 will buy ten pounds of beans, and ten pounds of beans will keep a person fed for a month. However, no exhausted doctor is going to be overjoyed to receive a handful of dried pinto beans, but jerky is another story. Jerky is expensive – but it’s also worth it, as you will discover the moment that you need it. If you filled just one of these boxes per month, in a year you’d be able to feed twelve of your friends and relatives. If you can afford one per week, in a year you’d have enough not only for your friends and relatives, but also for the entire sandbagging crew who’s fighting to hold the levy. Is it worth it? What’s it worth to refuel a worn-out nurse? What’s it worth to feed a frightened child in the midst of a storm? What’s it worth to not have to worry about your own empty belly when you’ve got bigger problems to deal with? Is it worth five bucks?